“In 2012, after trading LPs, I sent Dirk a long track of collaged, stretched tape pieces to see if it was something he could work with. This particular set of recordings seemed puzzling to me, and unworkable. Later, after a tour with Mono he actually sent me some tracks that he had made while listening to the piece. Out of the blue, maybe a year later, I went back and listened to our tracks, having some distance for my ears, and had an idea. Using the original track that I sent Dirk at the very beginning as a sound source, I shaped it exactly like Dirk’s responding source file – the musical colour and frequencies were the same, but the effects and enveloping were triggered by the waves of Dirk’s track. 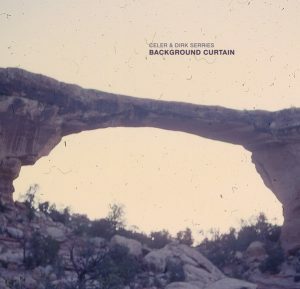 Already in 2012 Will Long, also known as Celer, and Dirk Serries, also known as Vidna Obmana and Fear Falls Burning (to name a few of his projects) started exchanging some sound material, but it took a full year before Long even had an idea what to do with Serries’ guitar sounds. Long explains this on the press text, but me no understand what he did: “Using the original track that I sent Dirk at the very beginning as a sound source, I shaped it exactly like Dirk’s responding source file – the musical colour and frequencies were the same, but the effects and enveloping was triggered by the waves of Dirk’s track. […] It may be hard to hear the two sides, but it’s really built by the background curtain, and even if you can’t hear it’s place, it’s definitely there. Where does one thing begin and another end? Maybe you can hear it?” It may explain the title of the release though. Both of these two pieces work with Serries long sustaining guitar drones sounds, with slowly envelop, overlaid, I guess, with Celer’s own drones, perhaps created by a transformation or two of the original Serries input, but then more stretched out, adding more variations of the same colour to the whole. ‘Above/Below’ is the darker side of the moon here, while the second piece, not surprisingly called ‘Below/Above’, represents the lighter side of the coin. This is music that absolute weightless space stuff, transporting the listener through an endless black universe and the notes of Serries, especially on ‘Below/Above’ are like little stars at the firmament. Maybe I just wrote that because of the impending Christmas season? I have no idea; it is one of those beautiful shiny winter days and Celer and Dirk Serries provide the perfect soundtrack for such a day, in which everything seems to slow down.